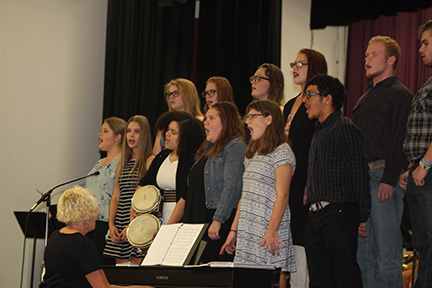 The Fall Music Concert, was an experience of school pride and fun. The concert could be split into three parts; vocal, band, and Oklahoma teaser. The concert started out with the Jr. High Vocal Class singing Don't Stop Believing and Wagon Wheel. After the Jr. High Vocal class, was the performance of the High School Vocal class. They sang a mix of Disney songs as well as the song Lean on Me. The next performance was the Jr. High Band. They performed Louie, Cold Hearted, Were not Gonna Take It, We will Rock you and Hey Song. Following them the High school band and Jr. High band together performed Crazy Train. After the combined performance, the High school band played Rockin' Robin, Carry on Wayward Son, Mission Impossible, Zoot Suit Riot. They added a few skits to their performances that made the audience laugh. Finally was the performance by the Oklahoma actors, they performed the song Oklahoma. The musical they will be performing is on Nov. 10-12.